Cabot's left-handed (top) and right-handed (bottom) versions of the Colt 1911. The 1911 Colt in .45 ACP has always been among my favorite semiautomatic pistols. Being of an older generation, I was issued one as an officer, but actually carried my own 1911 while on duty. This was in keeping with the “traditions of the service” where for hundreds of years officers had carried their own sidearms, but this practice did get me into some mild trouble on occasion. Nonetheless, I was very comfortable shooting my gun and did. Although I now almost exclusively use and hunt with muzzleloading firearms, including handguns, I have a soft spot in my heart for the 1911. Occasionally I will see some new variants on this platform that I think are particularly useful. Two such pistols appeared at the 2012 Shot Show. The first was a left-handed version of the .45 1911 Colt made by Cabot. As designer Rob Bianke explained, this pistol is a true left-handed design with everything switched to the other side of the frame – not just the safety, as has sometimes been done in the past. Cabot’s pistols are meticulously machined to tiny tolerances, with just enough play to provide for reliable function. These guns are expensive and sell for up to $6,000 for target-grade guns. This is pricy, but the guns sell as fast as the company can put make them. Despite the rise in popularity of more modern designs like the Glock, the old Colt still has a loyal following, as witnessed by increasing numbers of them being made by companies like High Standard, Ithaca and even Remington, to name a few. To find out more about Cabot’s pistols go to: www.cabotgun.com. 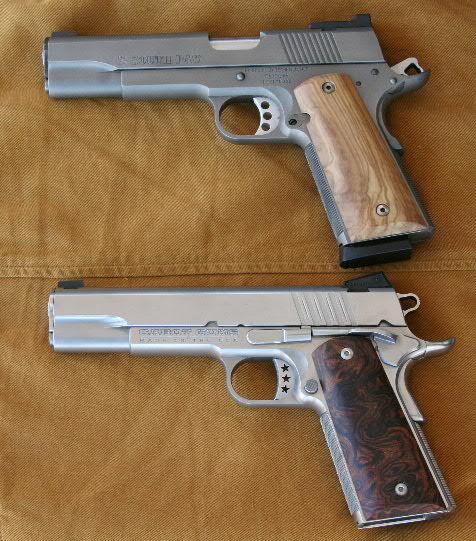 Dan Coonan with two variations of his 6-inch .357 Magnum 1911s. 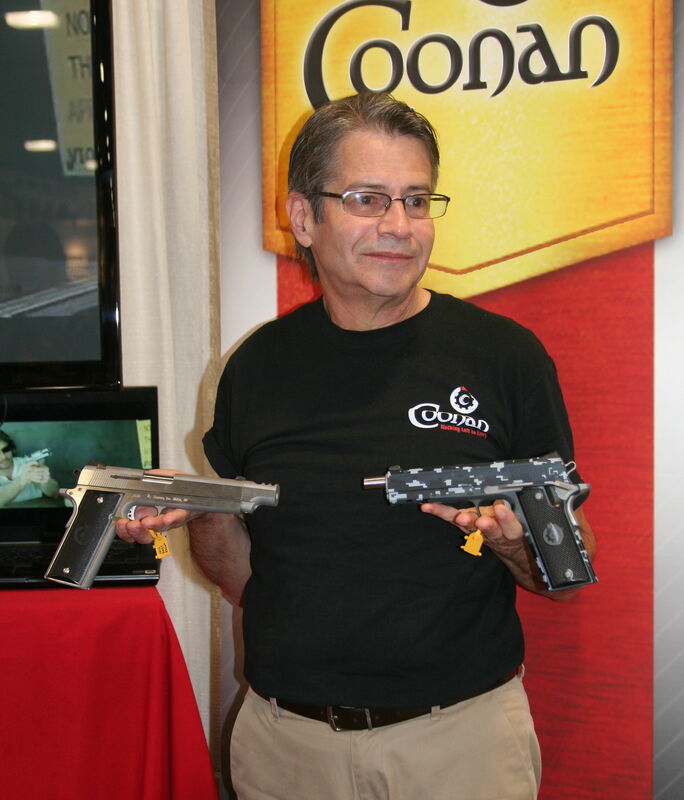 One of the most enjoyable interviews that I had at the show was with Dan Coonan of Coonan, Inc. Dan designed a 1911 frame gun that would shoot the .357 Magnum Revolver cartridge back in the 1980s and has been progressively improving his guns ever since. Rather than being an exact copy of the Colt 1911, he incorporated some design features of the later Browning Hi-Power, such as a pivoting trigger and linkless barrel, to modernize the gun. In addition the grip was enlarged and a new magazine designed to accommodate the longer, rimmed cartridge. This design allowed him to lengthen the barrel on some models from 5 to 6-inches to comply with some states’ regulations that require the longer barrel on hunting handguns. Ballistics from Coonan’s pistols are superior to 6-inch revolvers because of the lack of the barrel-cylinder gap. He can also put compensators on these longer-barreled guns which considerably reduces recoil. I addition, he ships each pistol with a spring set for .38-Specials so these loads can be used for plinking and practice. These are very nicely made guns in a practical caliber that is superior to the .45 ACP as a hunting cartridge. When I was shooting the .45s and .357 Magnum, I handloaded and played around with both. I ultimately went with revolvers and then single shots for their superior ballistics and better functionality with the lead and soft-pointed hunting bullets that were available in the 1970s. From there I progressed, or regressed, to single shot muzzleloading pistols where every shot is a custom load offering unlimited possibilities to fit any game or use. Coonan has a nice website at www.coonaninc.com where you can take a good look at his guns. My interview with Rob Bianke is on “Deja Vu Vegas. Shot Show 2012. Part I” which was broadcast on WebTalkRadio.net on January 30, 2012 and Dan Coonan’s interview is on Part II Ext. that was aired on February 13. To listen to these shows go to my website www.hoveysmith.com and click on the live link to the show immediately below the banner. This will connect you to my show page where these shows are listed under “archived shows.” Both interviews explain why and how these American-made guns were produced. Although many items are available to document the rich history of European boar hunting, little is available about American hog hunting. 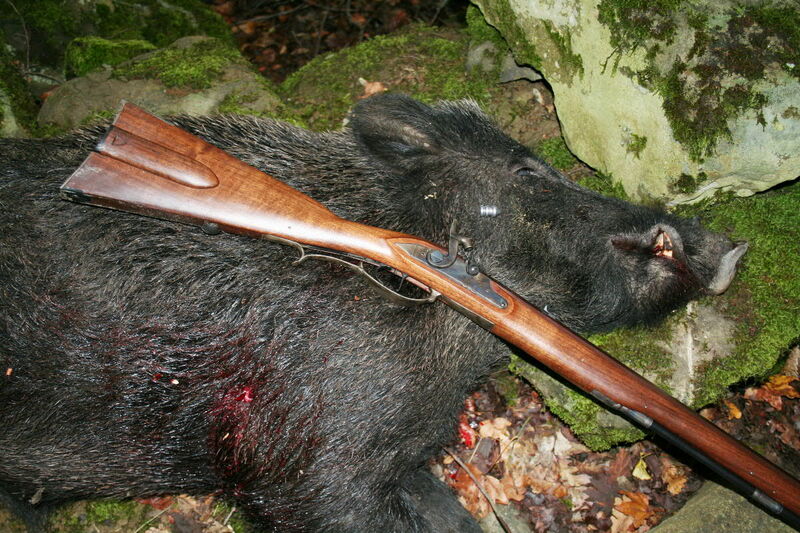 This hog was taken in Italy with a modern .54-caliber muzzleloading rifle made by Davide Pedersoli. In the world of sporting art there are sufficient representation of deer paintings, prints, plates, mugs, throws, night lights, coat racks, silverware, chandeliers, etc., that I could have brought home a tractor-trailer full of deer stuff from the 2012 Shot Show. Only very recently have I started seeing any art about U.S. wild hog hunting, although much such material has always been available about European boar hunting and the African warthog. 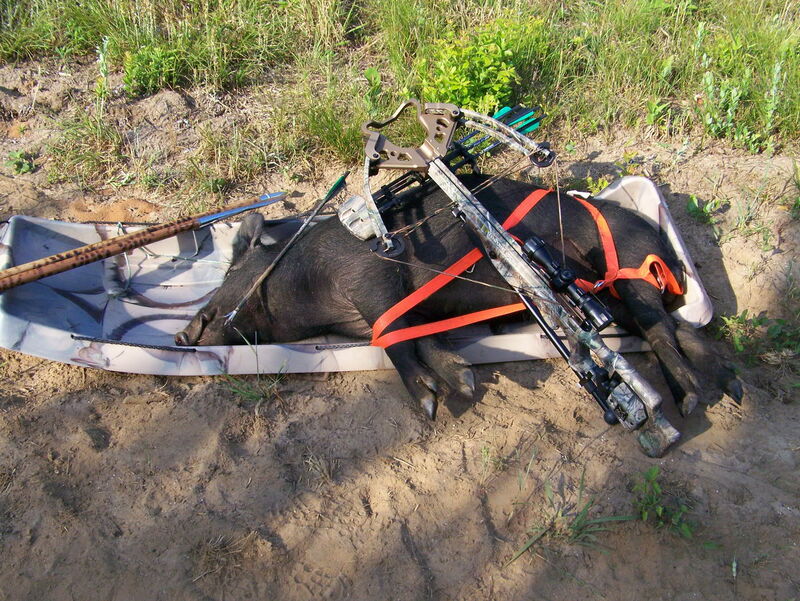 A Georgia hog taken with a crossbow on an all-night hunt that took place during the blue moon in June, 2010, with a TenPoint crossbow. I have hunted both the European boar in Italy and the warthog in Africa, but my everyday hog hunting is in Georgia and Texas. These rapidly breeding creatures are also found in about half of the “Lower 48” states and in Hawaii. They are much more commonly hunted that say, moose; but there are many more depictions of moose in art than wild hogs. I am pleased to report that there is a very small positive trend to supply some artworks that do reflect this increasingly significant part of North America’s big-game hunting. Although close records are not kept by state agencies, I suspect that wild hogs, which may often be hunted all year with no restrictions on the numbers taken, are second only to whitetail deer as the nation’s most commonly taken big-game animal. Why then, can’t you purchase very many paintings, prints, etc. of the sport even though they are often hunted and we need to shoot more of them? I suppose the answer is, “They are just hogs.” Indeed, many of them are domesticated hogs that have gone wild and may be identical to barnyard species. However, where they have been out for decades they revert back to more of the appearance of the Eurasian wild boar and, in some areas, may have some wild boar ancestry where imported animals have escaped and bred with local hogs, as in Tennessee and elsewhere. This hunt could have taken place anywhere from coastal North Carolina to Texas. This painting is available as a framed print from Reflective Art and may even be purchased from your local sporting goods retailer. The pictures show here are quite different in tone. 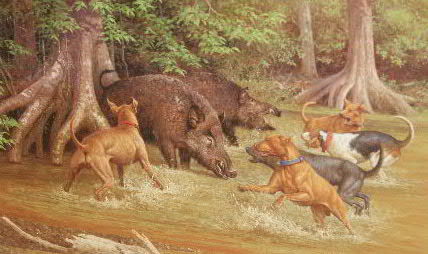 This dog hunt for wild hogs was produced and sold by Reflective Art. This framed print may be purchased from many of the large sporting goods outlets and possibly directly from the company. Tom Hoover, the company owner, commissions artworks and sells them as framed prints, mugs and other decorative items. More of his materials may be seen on his website www.reflectiveart.com. The eager hunting party departs to hunt hogs in coastal Georgia. 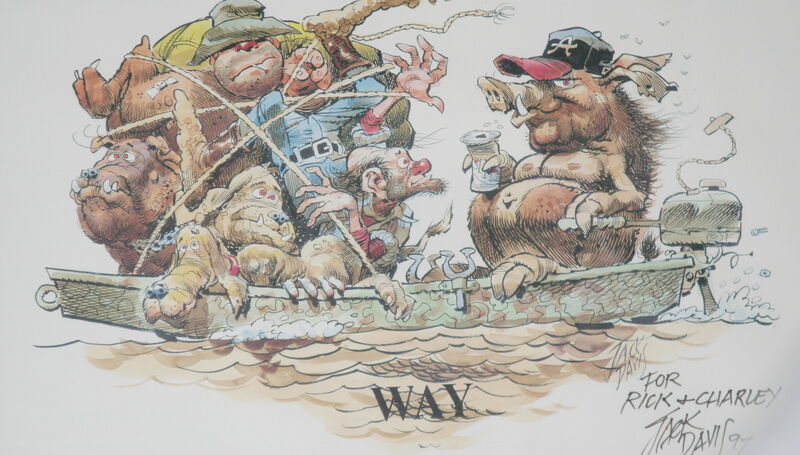 The second, more humorous look at “hog catching” is hanging on the wall of Mudcat Charley’s, a seafood restaurant on the Altamaha River. This restaurant is listed as located on Ricefield Road with a Brunswick, Georgia, address; but is across the river from Darien on U.S. 17. This was done by a local artist and given to the owners. 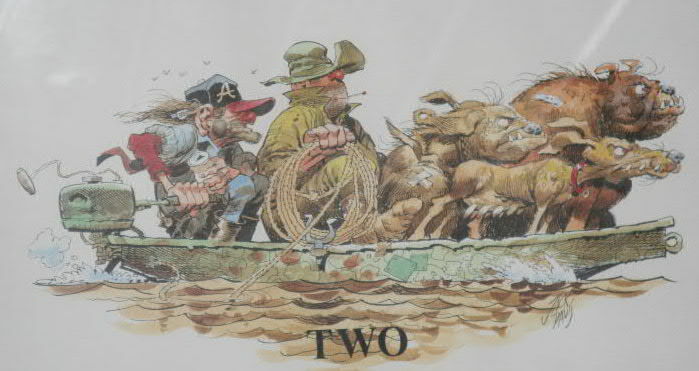 The watercolor depicts another style of hog hunting very commonly done in the South were the objective is to catch the hogs, rather than kill them. The result is that they are penned and fattened for slaughter. Smallish wild hogs, 200 pounds and less, are excellent eating providing they have been on good feed. If they have been feeding on fiddler crabs in the marsh; they are not – hence the need to “finish them off” on corn. The return. Sometimes you get the hog and sometimes the hog gets you. The title of this pair of paintings is named “Two Way” and seeks to document the eager hunters and dogs going out to catch some hogs from islands in the coastal marshes and their ignominious return. The reality is that numbers of these hogs are in the 200-pound range, some are taken every year that weigh over 600 pounds and they have been known to go over 1,000 pounds. Once they are 200-p0unders there is no predator that will take them on and sows are fiercely protective of their piglets. As they throw litters of 10 to 12 and breed twice a year, two hogs can very quickly become 200 hogs if they are not aggressively hunted. 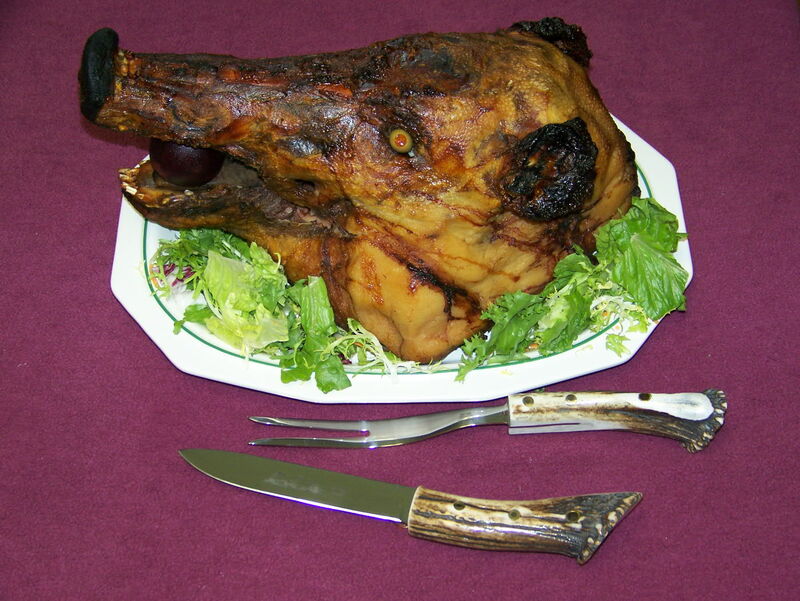 Roasted boar’s head with Polish wild boar carving set. In various parts of the nation hogs are taken many ways. They are trapped, speared, knifed, shot with firearms of all sorts or hand caught. These are typically very close range encounters. I don’t have the stamina to dog hunt them any more, but mostly stalk them or shoot them from elevated stands. The end result is some good eating pork that I cook in a variety of ways. Although you do have to wear gloves to prevent potentially picking up some really nasty blood-born diseases, I enjoy working up and eating my wild hogs. This can be an exploration of the eatable arts as illustrated by the whole roasted boar’s head that I did a few years ago. If you have your own pieces of American hog hunting art or produce such items feel free to reply to this post and attach a thumbnail of the art and contact info. You would now want to be facing this end of a Gatling gun in 1877 or today. 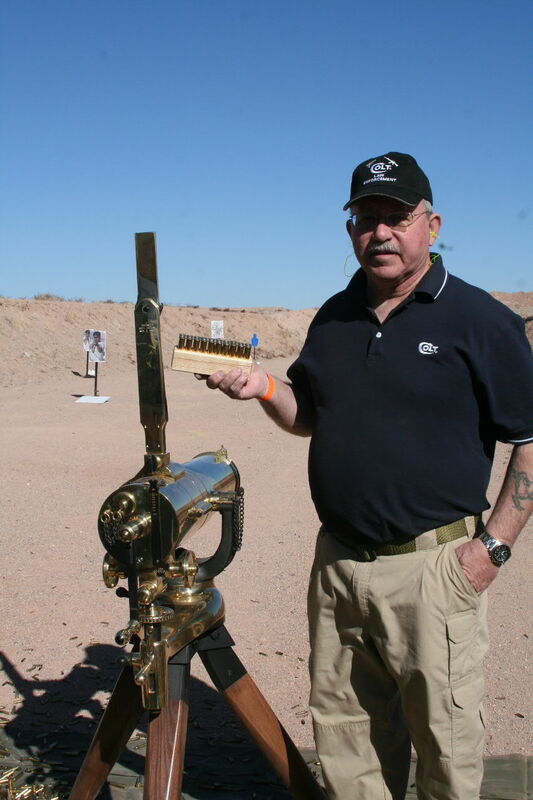 An unquestioned “hit” at Range Day of the 2012 Shot Show was a chance for us gun writers to shoot a replica of Colt’s 1877 Bulldog Gatling gun in .45-70. This gun already had a bit of history by the time it appeared on the range. 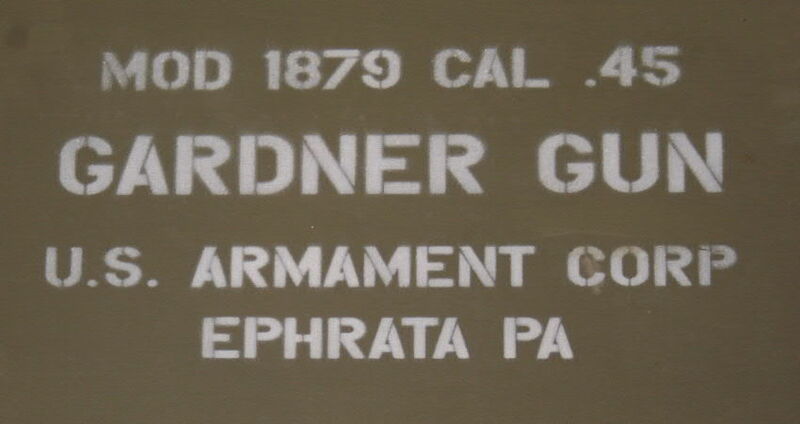 It was made, along with the two-barreled Gardner Gun, by U.S. Armament Co. of Ephrata, Pennsylvania. This company produces Navy Arms’ Springfield .30-’06 bolt-action rifles and both rapid-fire guns appeared at the Navy Arms’ booth last year. Colt liked the gun so much that they apparently gave U.S. Armament a better offer and became the distributor of the gun. Although they originally made this pattern, all of the machinery was either redirected and/or scrapped 50 or more years ago as the company tooled up for two World Wars. These Gatlings were made in various sizes including some huge ones mounted on battleships. In the days before the Browning machine guns, these Gatlings were the preferred guns for defending fortifications and ships against men and small boats. The guns were always heavy and cumbersome, which is the reason that Custer left his behind while he raced for what he was sure would be a quick victory against the Sioux at the Little Big Horn. Even though this is among the smallest, if not the smallest, of the commercial Gatlings, it is certainly not a light-weight gun. This model was fed by a vertical magazine that was quickly charged using wooden loading blocks filed with 20 rounds of .45-70s. Each writer had a chance to crank these 20 rounds downrange. The heavy gun showed no indications of recoil and remained absolutely stable when it was fired. The five barrels spit out lead all day, practically non-stop. If there were any malfunctions, I did not hear about them. 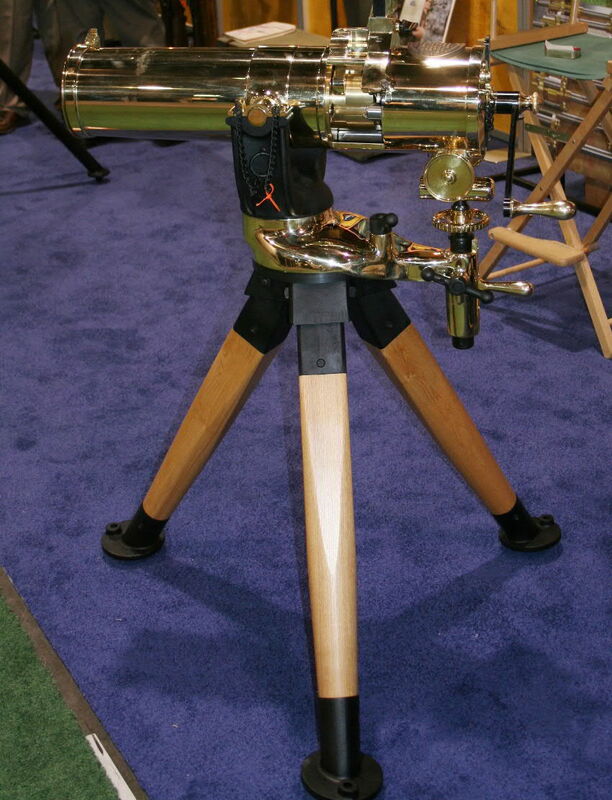 One advantage of the Gatling mechanism is that each barrel’s firing mechanism is independent. Should one barrel fail to function the gun is not disabled. The unfired round is chambered and then ejected along with the empties from the other barrels. This was a very practical consideration in the early days of metallic cartridges. Shooting the gun was done by rotating the crank which functioned very smoothly. My complements to the people who did the machining on this gun. Combining brass and steel components, as done here, is a challenge. I cannot say anything about accuracy, except that all of the bullets plowed up dust on the backstop. I, and the other writers, enjoyed and appreciated this opportunity to actually shoot “a bit of history.” Most of us had done military time and shot the Browing machine guns, M 60s and later models introduced into the U.S. service. Although I have no great need to do that again, cranking off 20 rounds with this Gatling gun was something special. You can hear about my experiences and the gun being shot on the January 30, 2012, edition of “Hovey’s Outdoor Adventures.” To get to the show quickly, go to my website, www.hoveysmith.com and click on the live link to the show immediately below the banner. This is an archived show. Scroll down on the WebTalkRadio.net show page and you will find it. As the show starts you will hear the steady rap-rap-rap of the gun as I shoot it. The word at the Shot Show was that some 40-odd of these Gatlings were made, and their current price was about $40,000 each. These are attractive and demonstrably well-made guns. As these are mechanically operated, they are legal for U.S. citizens to own; should you have any unquenched desires in this direction. I don’t know about the fate of the two-barreled Gardner gun. Last year the Navy Arms rep said that it had a selling price of about $26,000. I did not see it at this year’s show, so the manufacturer may still be looking for a sales outlet. It was also chambered for the .45-70 cartridge. The Gardner was used, I have read, in the Spanish-American war. Although the .30-40 Krag had been introduced, many U.S. troops were still using the Allen-action single-shot Springfields in Cuba and elsewhere. The Cuban Gardners might have been chambered for either cartridge, but I would suspect that they were most likely .45s. This use was among the first tactical use of machine guns by small units of U.S. forces in a ground action. Previously, the guns were mostly considered for defending fixed positions. If not a Gatling gun, what about a Gardner? 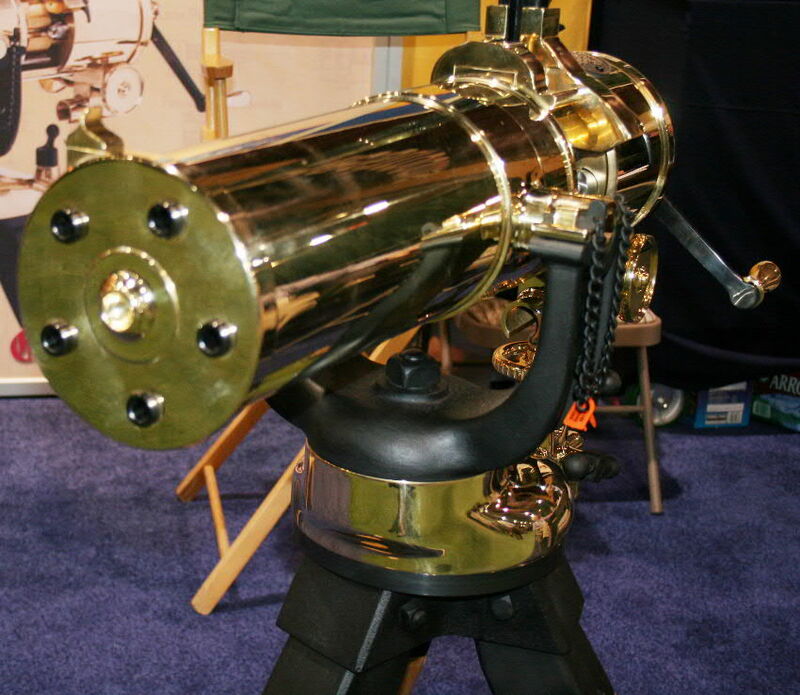 The Gatling design resurfaced in modern times as a rapid fire, link-fed air-craft and surface machine gun which can sustain a more rapid rate of fire for longer periods than any single-barrel design.